Another wet weekend could be in store for San Diego County with a low-pressure system expected to reach Southern California by Friday evening, according to the National Weather Service. 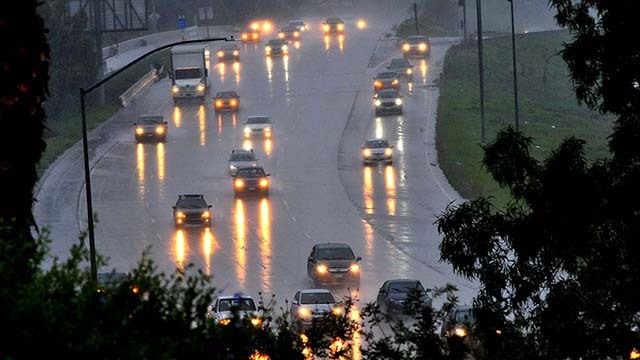 The storm system moving in from the north is not expected reach San Diego County until early Saturday morning and precipitation totals will not reach above one-tenth of an inch in most of the county, weather service meteorologist Stephanie Sullivan said. The chance of measurable precipitation Saturday has been set at 60 percent in coastal areas and 50 percent for the inland valleys as well as the county mountains, according to the weather service. The low-pressure system will bring a chance of light precipitation early Saturday morning with another chance of mostly light precipitation late Sunday morning into Sunday night before exiting the region by Monday morning, Sullivan said. Around one-tenth of an inch of rainfall is expected in most coastal and inland-valley areas Saturday while light snow could fall above 4,500 feet in the mountains, according to the weather service. No rainfall is forecast for the deserts while the mountains could get up to a quarter-inch of rainfall through Sunday night. High temperatures Friday could reach 64 near coastal areas and the inland valleys, 60 near the foothills, 55 in the mountains and 61 in the deserts. Another storm system could bring precipitation Wednesday into Thursday, but there is still a lot of uncertainty about the timing of that system as well as how much precipitation it could generate, Sullivan said.